The winning factor of the company has always been the capacity to understand the needs of the inflatable and leisure market, and offering a diversified range of products both for functionality and price. The mission is shown by the attention given by the company towards different markets and customers by adopting such a wide and various range of products in order to satisfy, each and every client, always maintaining the quality standards to a high level. A mission that has permitted the company to consolidate and to become leader in this sector, covering the medium, to high segment of the different markets. Innovations Xtreme offers you an endless range of inflatables for sale both in the UK, Europe and Worldwide. Our products are always designed to the highest quality with fantastic artwork at great prices. We make games for adults for corporate entertainment and team building businesses. Our fantastic designers can create fun, professional and truly excellent products for any given requirement. Our reputation for bespoke and custom made inflatables is second-to-none. 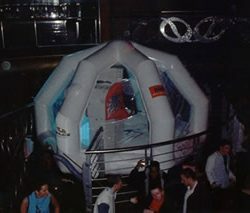 • Unique and exclusive Inflatable buildings and structures, For example: Inflatable Church/Chapel, Inflatable Pub, Inflatable Mosque, Inflatable Nightclub, Inflatable Cocktail Bar also an Inflatable Ski Simulator to name but a few of our world exclusive products. 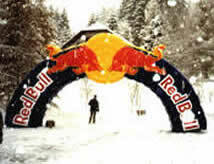 • Marketing Inflatables for example: Inflatable Arches, Inflatable Marquees, Inflatable Pillars etc. • Bouncy castles – A frame, pillar & beam, arched, themed, disco domes, low bouncers, slide combo units and any other type you can imagine! • Swimming pool inflatables – Aqua runs, constant flow, sealed inflatables, aqua slides, water slides. 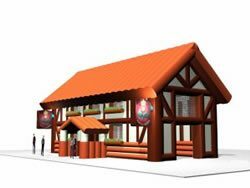 • Promotional inflatables – Arches, columns, sky dancers, bespoke and custom designed eye-catching items! • Inflatable games for teenagers & adults – rodeo bulls, laser mazes, sumo suits, bungee games and more. • Industry accessories – including fans/blowers, cleaning products and ropes. Innovations Xtreme has developed from a small company to an international manufacturer and supplier of the highest quality affordable inflatables on the market. Over 10 years on and Inflatable Church has gone from strength to strength. We now have offices in the UK and Spain. Innovations Xtreme is proud to have the expertise to offer you the peace of mind – in the unlikely event you should encounter a problem, you will be well looked after by our experienced and friendly customer service team, available for you to speak to at any time and ready to help you. Quite simply, if you can imagine it, Innovations Xtreme can make it!